Logistics companies face the toughest challenges in business today. Delivering products faster and more conveniently than your competitors is key to your success. That’s why you need the right tools to communicate with your shippers and customers. With Nectar Desk, you set yourself up to rise above the competition. Nectar Desk will give you a phone system that will help your agents take and make calls more easily. Our interactive voice response (IVR) system and automatic call distribution system will place any inbound dialer to the place they need to be. With Nectar Desk, any call detail record is easily recorded and retrieved. Call monitoring and recording has never been easier with Nectar Desk’s computer telephony integration technology. Information is organized, secure, and easily accessible. As a logistics company, the precise calculation of key metrics is important. 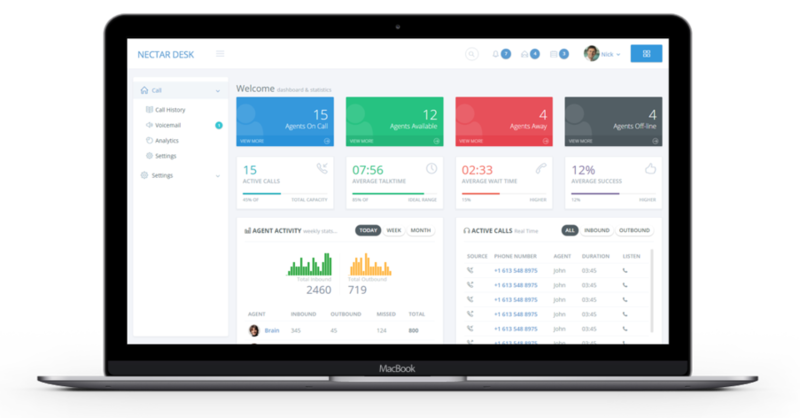 Nectar Desk’s analytics dashboard allows you to gain insight into the call activity of your staff. You will be able to see where you are short staffed to better plan for peak hours. Logistics is all about optimization. Let Nectar Desk optimize your business even further.